Beautifully finished home offering lots of space and high level finishes. 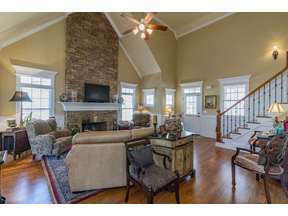 High ceilings, lots of windows, french doors, great porches and walk to the clubhouse, restaurant and pool. Beautiful hardwood floors and lots of wood trim make this home unique along with floor to ceiling stone fireplace. Lots of space for friends and family yet house is very comfortable living on one floor. Enjoy the lake, pond and golf views from your large porch with vinyl windows. This house is in excellent condition with full finished upper and lower levels. Outside taken cared for my HOA and enjoy all the Harbor Club amenities close by. Great value, condition, quality and location!